Suppose a charge +Q1 is given to the positive plate and a charge −Q2 to the negative plate of a capacitor. What is the “charge on the capacitor”? Let ABCD be the Gaussian surface such that faces AD and BC lie inside plates X and Y, respectively. Let q be the charge appearing on surface II. Then, the distribution of the charges on faces I, III and IV will be in accordance with the figure. Now, to determine qâ€‹ in terms of Q1 and Q2, we need to apply Gauss’s law to calculate the electric field due to all four faces of the capacitor at point P. Also, we know that the electric field inside a capacitor is zero. Q1+Q22, which is the charge on faces II and III. C=1V Q,can you say that the capacitance C is proportional to the charge Q? No. Since capacitance is a proportionality constant, it depends neither on the charge on the plates nor on the potential. It only depends upon the size and shape of the capacitor and on the dielectric used between the plates. ∈0AdHere, A is the area of the plates of the capacitor and d is the distance between the plates of the capacitor. A hollow metal sphere and a solid metal sphere of equal radii are given equal charges. Which of the two will have higher potential? The potential of a metal sphere is directly proportional to the charge q given to it and inversely proportional to its radius r.
V=q4π∈0rSince both the spheres are conductors with the same radius and charge, the charge given to them appears on the surface evenly. Thus, the potential on the surface or within the sphere will be the same, no matter the sphere is hollow or solid. The plates of a parallel-plate capacitor are given equal positive charges. What will be the potential difference between the plates? What will be the charges on the facing surfaces and on the outer surfaces? It is given that the plates of the capacitor have the same charges. In other words, they are at the same potential, so the potential difference between them is zero. –q and the distribution is according to the figure. Now, as point P lies inside the conductor, the total field must be zero. Hence, on faces II and III, the charge is equal to zero; and on faces I and IV, the charge is Q. Thus, it seems that the whole charge given is moved to the outer surfaces, with zero charge on the facing surfaces. A capacitor has capacitance C. Is this information sufficient to know what maximum charge the capacitor can contain? If yes, what is this charges? If no, what other information is needed? No. This information is not sufficient. Since the charge is proportional to the potential difference across the capacitor, we need to know the potential difference applied across the capacitor. Here, q is the charge, V is the potential difference applied and C is the proportionality constant, i.e. capacitance. The dielectric constant decreases if the temperature is increased. Explain this in terms of polarization of the material. The amount of polarisation can be understood as the extent of perfect alignment of the molecules of a dielectric with an external electric field. The more aligned the molecules are with the external magnetic field, the more is the polarisation and the more will be the dielectric constant. But with increase in temperature, the thermal agitation of the molecules or the randomness in their alignment with the field increases. Thus, we can say that increase in temperature results in reduced polarisation and reduced dielectric constant. When a dielectric slab is gradually inserted between the plates of an isolated parallel-plate capacitor, the energy of the system decreases. What can you conclude about the force on the slab exerted by the electric field? As the energy of the system decreases, the change in the energy is negative. Force is defined as a negative rate of change of energy with respect to distance. -∂U∂xSo, as the energy decreases, the force due to the electric field of the capacitor increases when the dielectric is dragged into the capacitor. Since the net charge enclosed by the Gaussian surface is zero, the total flux of the electric field through the closed Gaussian surface enclosing the capacitor is zero. q = Total charge enclosed by the Gaussian surface. (d) C/2 and 2 V.
Since the voltage gets added up when the capacitors are connected in series, the voltage of the combination is 2V. In a parallel combination of capacitors, the potential difference across the capacitors remain the same, as the right-hand-side plates and the left-hand-side plates of both the capacitors are connected to the same terminals of the battery. Therefore, the potential remains the same, that is, V.
q22∈0ASince the capacitor is isolated, the charge on the plates remains constant. We know that the charge is conserved in an isolated system. Thus, the force acting between the plates remains unchanged. A parallel-plate capacitor has plates of unequal area. The larger plate is connected to the positive terminal of the battery and the smaller plate to its negative terminal. Let Q, and Q be the charges appearing on the positive and negative plates respectively. (d) The information is not sufficient is decide the relation between Q, and Q.
Q+=Q-The charge induced on the plates of a capacitor is independent of the area of the plates. ∞The thin metal plate inserted between the plates of a parallel-plate capacitor of capacitance C connects the two plates of the capacitor; hence, the distance d between the plates of the capacitor reduces to zero. It can be observed that the charges on the plates begin to overlap each other via the metallic plate and hence begin to conduct continuously. In this case, d = 0. Figure (31-Q3) shows two capacitors connected in series and joined to a battery. The graph shows the variation in potential as one moves from left to right on the branch containing the capacitors. (d) The information is not sufficient to decide the relation between C1 and C2. Region AB shows the potential difference across capacitor Câ€‹1 and region CD shows the potential difference across capacitor C2. Now, we can see from the graph that region AB is greater than region CD. Therefore, the potential difference across capacitor C1 is greater than that across capacitor C2. 1K of the original field when we insert a dielectric between the plates of a capacitor (K is the dielectric constant of the dielectric). So, if the oil is pumped out, the electric field between the plates will increase, as the dielectric has been removed. Q1Q2=C1C2When the spheres are connected, charges flow between them until they both acquire the same common potential V.
(d) 2 µF, 18 µF. (d) the separation between the plates. 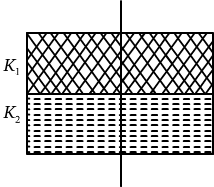 ∈0AdHere, A is the area of the plates of the capacitor and d is the distance between the plates. So, we can clearly see that the capacitance of a capacitor does depend on the size and shape of the plates and the separation between the plates; it does not depend on the charges on the plates. A dielectric slab is inserted between the plates of an isolated charged capacitor. Which of the following quantities will remain the same? When we insert a dielectric between the plates of a capacitor, induced charges of opposite polarity appear on the face of the dielectric. They build an electric field inside the dielectric, directed opposite to the original field of the capacitor. Thus, the net effect is a reduced electric field. qV2Thus, only the charge on the capacitor remains unchanged, as the charge is conserved in an isolated system. A dielectric slab is inserted between the plates of a capacitor. The charge on the capacitor is Q and the magnitude of the induced charge on each surface of the dielectric is Q‘. (a) Q‘ may be large than Q. (b) Q‘ must be larger than Q. (c) Q‘ must be equal to Q. (d) Q‘ must be smaller than Q. (d) Qâ€‹’ must be smaller than Q.
Q1-1KHere, K is the dielectric constant that is always greater than or equal to 1. So, we can see that for K > 1, Q‘ will always be less than Q. In H.C Verma the answer is (a), (c) ,(d). But according to us the answer should be (a), (b), (d) all these options are the properties of a capacitor and the option (c) is incorrect because the battery is a source of energy not charge. Moreover if a capacitor plates have equal charge on outside and equal charge on inside then one can think that the charge on the plates must be also equal so option (b) cant be incorrect. The separation between the plates of a charged parallel-plate capacitor is increased. Which of the following quantities will change? (c) Energy of the capacitor. Because the charge always remains conserved in an isolated system, it will remain the same. Qd∈0AHere, Q, A and d are the charge, area and distance between the plates, respectively. Thus, as d increases, V increases. So, it will also increase. 12∈0E2So, u will remain constant with increase in distance between the plates. A parallel-plate capacitor is connected to a battery. A metal sheet of negligible thickness is placed between the plates. The sheet remains parallel to the plates of the capacitor. (a) The battery will supply more charge. (b) The capacitance will increase. (c) The potential difference between the plates will increase. (d) Equal and opposite charges will appear on the two faces of the metal plate. ∈0Ad. In other words, there will not be any change in the electric field, potential or charge. Only, equal and opposite charges will appear on the two faces of the metal plate because of induction due to the presence of the charges on the plates of the capacitor. X − connect the capacitor to a battery of emf ε.
Y − disconnect the battery. Z − reconnect the battery with polarity reversed. W − insert a dielectric slab in the capacitor. (a) In XYZ (perform X, then Y, then Z) the stored electric energy remains unchanged and no thermal energy is developed. (b) The charge appearing on the capacitor is greater after the action XWY than after the action XYZ. (c) The electric energy stored in the capacitor is greater after the action WXY than after the action XYW. (d) The electric field in the capacitor after the action XW is the same as that after WX. If the potential is held constant, that is, the battery remains attached to the circuit, then the charge on the capacitor increases by a factor of K on inserting a dielectric of a dielectric constant K between the plates of the capacitor. Here, q0 and q are the charges without dielectric and with dielectric, respectively. The amount of charge stored does not depend upon the polarity of the plates. Thus, the charge appearing on the capacitor is greater after the action XWY than after the action XYZ. ε. Hence, inserting a dielectric after disconnecting the battery will not bring any change in the amount of charge stored in the capacitor. So, the energy stored in the capacitor will also not change after the action XYW. However, during the action WXY, the amount of charge that will get stored in the capacitor will get increased by a factor of K, as the battery is disconnected after inserting a dielectric between the plates of the capacitor and the energy stored will also get multiplied by a factor of K.
Thus, the electric energy stored in the capacitor is greater after the action WXY than after the action XYW. The electric field between the plates E depends on the potential across the capacitor and the distance d between the plates of the capacitor. ε. Thus, the electric field E remains the same. When 1⋅0 × 1012 electrons are transferred from one conductor to another, a potential difference of 10 V appears between the conductors. Calculate the capacitance of the two-conductor system. As 1.0 × 1012 electrons are transferred from one conductor to another, the conductor to which the electrons are transferred becomes negatively charged and the other conductor becomes positively charged. The capacitance C is the ratio of the magnitude of the charge on either conductor to the magnitude of the potential difference between the conductors. The plates of a parallel-plate capacitor are made of circular discs of radii 5⋅0 cm each. If the separation between the plates is 1⋅0 mm, what is the capacitance? Suppose, one wishes to construct a 1⋅0 farad capacitor using circular discs. If the separation between the discs be kept at 1⋅0 mm, what would be the radius of the discs? Thus, the radius of the plates of the capacitor for the given configuration is 6 km. A parallel-plate capacitor having plate area 25 cm2 and separation 1⋅00 mm is connected to a battery of 6⋅0 V. Calculate the charge flown through the battery. How much work has been done by the battery during the process? C=∈0 Ad=8.85×10-12×25×10-41×10-3 =2.21×10-11 FWhen the battery of voltage 6 V is connected to the capacitor, the charge (Q) that flows from the battery is equal to the amount of the charge that the given capacitor can hold. ⇒Q=2.21×10-11×6.0 =1.33×10-10 CThe work done by the battery in charging the capacitor is calculated by taking the product of the magnitude of the charge transferred and the voltage of the battery. A parallel-plate capacitor has plate area 25⋅0 cm2 and a separation of 2⋅00 mm between the plates. The capacitor is connected to a battery of 12⋅0 V. (a) Find the charge on the capacitor. (b) The plate separation is decreased to 1⋅00 mm. Find the extra charge given by the battery to the positive plate. The capacitances of three capacitors are C1= 2 μF, C2= 4 μF and C3= 6 μF and the voltage of the battery (V) is 12 V.
Due to parallel connection, the potential difference across each capacitor is the same and is equal to 12 V.
Three capacitors having capacitances 20 µF, 30 µF and 40 µF are connected in series with a 12 V battery. Find the charge on each of the capacitors. How much work has been done by the battery in charging the capacitors? 1ceq=1c1+1c2+1c31ceq=120+130+140×110-6⇒ ceq=9.23 μFBecause the capacitors are connected in series, the same charge will go to each of them and it is equal to the total charge given by the battery. Let the charge at each capacitor be q. Find the charge appearing on each of the three capacitors shown in figure (31-E2). Let us first find the equivalent capacitance. It can be observed from the circuit diagram that capacitors B and C are in parallel and are in series with capacitor A. It is the same as the capacitance of capacitor A. Therefore, equal potential difference will be there on capacitor A and the system of capacitors B and C.
C1=4·0 μF and C2=6·0 μFin figure (31-E3). Calculate the equivalent capacitance of the combination between the points indicated. For the combination of capacitors given in figure (a), the pairs of capacitors C1 and C2 are in parallel. For the combination of capacitors given in figure (b), the pairs of capacitors C1 and C2 are in parallel. In the above circuit, it can be seen that CA and CB are in series and are in parallel to the series combination of CC and CB. 1Ceq=1CA+1CB=1C1+C2+1C1+C2=110+110=15⇒Ceq=5 μFSimilarly, the equivalent capacitance of the series combination of CC and CD is 5 μF. Find the charge supplied by the battery in the arrangement shown in figure (31-E4). It can be observed that capacitors C1 and C2 are in parallel. The outer cylinders of two cylindrical capacitors of capacitance 2⋅2 µF each, are kept in contact and the inner cylinders are connected through a wire. A battery of emf 10 V is connected as shown in figure (31-E5). Find the total charge supplied by the battery to the inner cylinders. The left plate of the capacitors (A and B) shown in the figure represents the inner plates of the cylindrical capacitors. As the capacitors are connected in parallel, the potential difference across them is the same. As plates A and B are connected to the positive terminal of the battery, the charge on each of them is +22 µC. Two conducting spheres of radii R1 and R2 are kept widely separated from each other. What are their individual capacitances? If the spheres are connected by a metal wire, what will be the capacitance of the combination? Think in terms of series−parallel connections. We need to calculate the capacitance of an isolated charged sphere. Let us assume that the charge on the sphere is Q and its radius is R.
Capacitance of the charged sphere can be found by imagining a concentric sphere of infinite radius consisting of −Q charge. 14π∈0QRCapacitance is the ratio of the magnitude of the charge on each conductor to the potential difference between them. C1=4π∈0 R1C2=4π∈0 R2If the spheres are connected by a metal wire, the charge will flow from one sphere to another till their potentials become the same. As there potentials become the same, the potential difference between the conductors for both the capacitors also becomes the same. Thus, it can be concluded that the capacitors are connected in parallel. Each of the capacitors shown in figure (31-E6) has a capacitance of 2 µF. find the equivalent capacitance of the assembly between the points A and B. Suppose, a battery of emf 60 volts is connected between A and B. Find the potential difference appearing on the individual capacitors. There are three rows of capacitors connected in parallel in the given system. 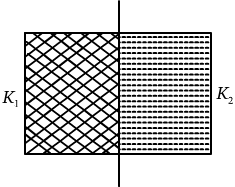 In each row, three capacitors of capacitance 2 μF are connected in series. The voltage across each row is the same and is equal to 60 V.
As all capacitors have the same capacitance in each row, the potential difference across their plates is the same. It is required to construct a 10 µF capacitor which can be connected across a 200 V battery. Capacitors of capacitance 10 µF are available but they can withstand only 50 V. Design a combination which can yield the desired result. Let the number of capacitors in series (connected in a row) be x. The maximum voltage that the capacitors can withstand is 50 V.
The voltage across each row should be equal to 200 V.
Let there be y such rows. So, the equivalent capacitance of the combination will be xy. Thus, to yield the required result, the combination of 4 rows, each of 4 capacitors having capacitance 10 µF and breakdown voltage 50 V, is required. Take the potential of the point B in figure (31-E7) to be zero. (a) Find the potentials at the points C and D. (b) If a capacitor is connected between C and D, what charge will appear on this capacitor? C2=3×63+6=189 μF=2 μFAs the two rows are in parallel, the potential difference across each row is the same and is equal to 50 V.
VC=503 V(b) As the potential difference between points C and D is zero, the bridge remains balanced and no charge flows from C to D. If a capacitor is connected between points C and D, then the change on the capacitor will be zero. Find the equivalent capacitance of the system shown in figure (31-E8) between the points a and b.
Capacitors C1 and C2 above and below ab are connected in series and in parallel with C3. A capacitor is made of a flat plate of area A and a second plate having a stair-like structure as shown in figure (31-E9). The width of each stair is a and the height is b. Find the capacitance of the assembly. From the figure, it can be observed that the capacitor assembly is made up of three capacitors. The three capacitors are connected in parallel. A3and the separation between the plates is d.
A3and the separation between the plates is (d + b). A3and the separation between the plates is (d + 2b). A cylindrical capacitor is constructed using two coaxial cylinders of the same length 10 cm and of radii 2 mm and 4 mm. (a) Calculate the capacitance. (b) Another capacitor of the same length is constructed with cylinders of radii 4 mm and 8 mm. Calculate the capacitance. C=2π∈0 llnR2R1⇒C=2×3.14×8.85×10-12×0.10ln 2 ⇒C=8 pF ∵ln 2= 0.693(b) When a capacitor of the same height with cylinders of radii 4 mm and 8 mm is taken, its capacitance comes to 8 pF, which is the same as above because the ratio of the radii is the same. A 100 pF capacitor is charged to a potential difference of 24 V. It is connected to an uncharged capacitor of capacitance 20 pF. What will be the new potential difference across the 100 pF capacitor? q1+q2=24×100 qC …(i)The potential difference across the plates of the capacitors will be the same. Each capacitor shown in figure (31-E10) has a capacitance of 5⋅0 µF. The emf of the battery is 50 V. How much charge will flow through AB if the switch S is closed? Q=Ceq× V⇒Q=23×(5.0 μF)×(50 V)⇒Q=5003 μCWhen the switch S is closed, no charge goes to the capacitor connected in parallel with the switch. Q=10 μF×50=500 μCThe initial charge stored in the shorted capacitor starts discharging.”? The particle P shown in figure (31-E11) has a mass of 10 mg and a charge of −0⋅01 µC. Each plate has a surface area 100 cm2 on one side. What potential difference V should be applied to the combination to hold the particle P in equilibrium? The particle is balanced when the electrical force on it is balanced by its weight. Both the capacitors shown in figure (31-E12) are made of square plates of edge a. The separations between the plates of the capacitors are d1 and d2 as shown in the figure. 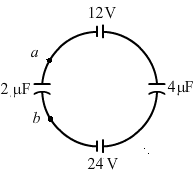 A potential difference V is applied between the points a and b. An electron is projected between the plates of the upper capacitor along the central line. With what minimum speed should the electron be projected so that it does not collide with any plate? Consider only the electric forces. ∈0a2d2It is given that the capacitors are connected in series. ∈0 a2d1+d2VAs the capacitors are in series, charge on both of them is the same. E=Vd1=Vd1+d2The charge on electron q is represented by e.
The plates of a capacitor are 2⋅00 cm apart. An electron-proton pair is released somewhere in the gap between the plates and it is found that the proton reaches the negative plate at the same time as the electron reaches the positive plate. At what distance from the negative plate was the pair released? Let the electric field inside the capacitor be E.
Let t be the time taken by the electron and proton to reach the positive and negative plates, respectively. The initial velocities of the proton and electron are zero. Convince yourself that parts (a), (b) and (c) figure (31-E13) are identical. Find the capacitance between the points A and B of the assembly. Parts (a), (b) and (c) are identical, as all of them form a bridge circuit. In that circuit, capacitors of 1 µF and 2 µF are connected to terminal A and the 5 µF capacitor and capacitors of 3 µF and 6 µF are connected to terminal B and the 5 µF capacitor. For the given situation, it can be observed that the bridge is in balance; thus, no current will flow through the 5 µF capacitor. So to simplify the circuit, 5 µF capacitor can be removed from the circuit. Now, 1 µF and 3 µF capacitors are in series. And 2 µF and 6 µF capacitors are also in series combination. These two combination are in parallel with each other. Thus, parts (a), (b) and (c) are identical. Va-Vbbetween the points a and b shown in each part of the figure (31-E14). 9q2+2 q2=48⇒11q2=48 ⇒q2=4811Now,Va-Vb=q24 μF=4844=1211 V(b) Let the charge in the loop be q. Find the equivalent capacitances of the combinations shown in figure (31-E15) between the indicated points. Applying star-delta conversion in the part indicated in the diagram. It is a balanced bridge. Therefore, the capacitor of capacitance 5 μF can be removed. It is also a balanced diagram. It can be observed that the bridges are balanced. Find the capacitance of the combination shown in figure (31-E16) between A and B.
Capacitors 5 and 1 are in series. 2×22+2=1 μFHence, the equivalent capacitance between points A and B of the given capacitor system is 1 μF. Find the equivalent capacitance of the infinite ladder shown in figure (31-E17) between the points A and B. Let the equivalent capacitance of the infinite ladder be C.
Because it is an infinite ladder, the change in the equivalent capacitance will be negligible if we add one more ladder at point AB, as shown in the given figure. A finite ladder is constructed by connecting several sections of 2 µF, 4 µF capacitor combinations as shown in figure (31-E18). It is terminated by a capacitor of capacitance C. What value should be chosen for C, such that the equivalent capacitance of the ladder between the points A and B becomes independent of the number of sections in between ? The equivalent capacitance of the ladder between points A and B becomes independent of the number of sections in between when the capacitance between A and B is C.
The value of C is 4 µF. 1·2×10-3 μF. Calculate the potential difference developed between the plates. The charge on the positive plate is q1 and that on the negative plate is q2. A charge of 20 µC is placed on the positive plate of an isolated parallel-plate capacitor of capacitance 10 µF. Calculate the potential difference developed between the plates. A charge of 1 µC is given to one plate of a parallel-plate capacitor of capacitance 0⋅1 µF and a charge of 2 µC is given to the other plate. Find the potential difference developed between the plates. 96/ε0×10-12Fm on one side and the separation between the consecutive plates is 4⋅0 mm. The emf of the battery connected is 10 volts. Find the magnitude of the charge supplied by the battery to each of the plates connected to it. Here, three capacitors are formed and each of them has area A. The capacitance between the adjacent plates shown in figure (31-E20) is 50 nF. A charge of 1⋅0 µC is placed on the middle plate. (a) What will be the charge on the outer surface of the upper plate? (b) Find the potential difference developed between the upper and the middle plates. (a) When the charge of 1 µC is introduced on plate B, the charge gets equally distributed on its surface. All sides of the plate gets 0.5 µC of charge. Due to induction, 0.5 µC charge is induced on the upper surface of plate A. Consider the situation of the previous problem. If 1⋅0 µC is placed on the upper plate instead of the middle, what will be the potential difference between (a) the upper and the middle plates and (b) the middle and the lower plates? -0.5 µC charge and the other side has +0.5 µC charge. Two capacitors of capacitance 20⋅0 pF and 50⋅0 pF are connected in series with a 6⋅00 V battery. Find (a) the potential difference across each capacitor and (b) the energy stored in each capacitor. Two capacitors of capacitances 4⋅0 µF and 6⋅0 µF are connected in series with a battery of 20 V. Find the energy supplied by the battery. Each capacitor in figure (31-E21) has a capacitance of 10 µF. The emf of the battery is 100 V. Find the energy stored in each of the four capacitors. Capacitors b and c are in parallel; their equivalent capacitance is 20 µF. A capacitor with stored energy 4⋅0 J is connected with an identical capacitor with no electric field in between. Find the total energy stored in the two capacitors. When the capacitors are connected, the charge flows from the charged capacitor to the uncharged capacitor. Because the capacitors are identical, the charge flows till the charge in both the capacitors becomes equal. E=q22CAs the charge in both the capacitors is the same, their capacitance is also the same. So, the energy is equally divided between them. Thus, the energy stored in each of the capacitors is 2.0 J. A capacitor of capacitance 2⋅0 µF is charged to a potential difference of 12 V. It is then connected to an uncharged capacitor of capacitance 4⋅0 µF as shown in figure (31-E22). Find (a) the charge on each of the two capacitors after the connection, (b) the electrostatic energy stored in each of the two capacitors and (c) the heat produced during the charge transfer from one capacitor to the other. q=C×V=12×2×10-6⇒q=24×10-6 C(a) On connecting the capacitors, the charge flows from the 2 µF capacitor to the 4 µF capacitor. Now, let the charges on the 2 µF and 4 µF capacitors be q1 and q2, respectively. As they are connected in parallel, the potential difference across them is the same. ∴V=q1C1=q2C2⇒V=q12=q24⇒q2=2 q1The total charge on the capacitors will be the same as the initial charge stored on the 2 µF capacitor. A point charge Q is placed at the origin. Find the electrostatic energy stored outside the sphere of radius R centred at the origin. A metal sphere of radius R is charged to a potential V. (a) Find the electrostatic energy stored in the electric field within a concentric sphere of radius 2 R. (b) Show that the electrostatic field energy stored outside the sphere of radius 2 R equals that stored within it. 1·0×10-4 C m-2. Find the electrostatic energy stored in a cubical volume of edge 1⋅0 cm in front of the plane. A parallel-plate capacitor having plate area 20 cm2 and separation between the plates 1⋅00 mm is connected to a battery of 12⋅0 V. The plates are pulled apart to increase the separation to 2⋅0 mm. (a) Calculate the charge flown through the circuit during the process. (b) How much energy is absorbed by the battery during the process? (c) Calculate the stored energy in the electric field before and after the process. (d) Using the expression for the force between the plates, find the work done by the person pulling the plates apart. (e) Show and justify that no heat is produced during this transfer of charge as the separation is increased. A capacitor having a capacitance of 100 µF is charged to a potential difference of 24 V. The charging battery is disconnected and the capacitor is connected to another battery of emf 12 V with the positive plate of the capacitor joined with the positive terminal of the battery. (a) Find the charges on the capacitor before and after the reconnection. (b) Find the charge flown through the 12 V battery. (c) Is work done by the battery or is it done on the battery? Find its magnitude. (d) Find the decrease in electrostatic field energy. (e) Find the heat developed during the flow of charge after reconnection. W=Vq=12×1200 =14400 J =14.4 mJIt is the work done on the battery. H=12 CV2=100×144 =7200 J=7.2 mJThis amount of energy is developed as heat when the charge flows through the capacitor. Consider the situation shown in figure (31-E23). The switch S is open for a long time and then closed. (a) Find the charge flown through the battery when the switch S is closed. (b) Find the work done by the battery. (c) Find the change in energy stored in the capacitors. (d) Find the heat developed in the system. Since the switch is opened for a long time, the capacitor is in series. A capacitor of capacitance 5⋅00 µF is charged to 24⋅0 V and another capacitor of capacitance 6⋅0 µF is charged to 12⋅0 V. (a) Find the energy stored in each capacitor. (b) The positive plate of the first capacitor is now connected to the negative plate of the second and vice versa. Find the new charges on the capacitors. (c) Find the loss of electrostatic energy during the process. (d) Where does this energy go? U2=12 C1 V22 =432 J=0.432 mJ(b) The capacitors are connected to each other in such a way that the positive plate of the first capacitor is connected to the negative plate of the second capacitor and vice versa. Now, let V be the common potential of the two capacitors. Given:U1=12 C1 V2andU2=12 C2 V2∴Uf=12 V2 C1+C2 =12 4.362 5+6 =12×19×11 =104.5×10-6 J =0.1045 mJ But Ui=1.44+0.433=1.873Loss of energy:∆U=1.873-0.1045 =1.7678 =1.77 mJ(d) The energy is dissipated as heat. A 5⋅0 µF capacitor is charged to 12 V. The positive plate of this capacitor is now connected to the negative terminal of a 12 V battery and vice versa. Calculate the heat developed in the connecting wires. As a capacitor of capacitance C is connected to the battery of voltage V, one of its plates gets charged to Q = CV and the other gets charged to −Q coulomb. When the polarity is reversed, charge −Q appears on the first plate and charge +Q appears on the second plate. So to maintain these charges, charge 2Q passes through the battery from the negative terminal to the positive terminal. W=2QV=2CE2In the given process, the capacitor’s energy remains the same in both cases. The work done by the battery appears as heat in the connecting wires. 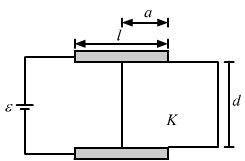 The two square faces of a rectangular dielectric slab (dielectric constant 4⋅0) of dimensions 20 cm × 20 cm × 1⋅0 mm are metal-coated. Find the capacitance between the coated surfaces. 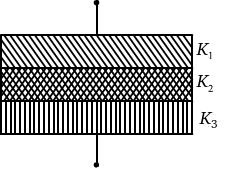 d=1 m=1×10-3 mHere, the thickness of the dielectric is the same as the separation between the parallel plates. If the above capacitor is connected across a 6⋅0 V battery, find (a) the charge supplied by the battery, (b) the induced charge on the dielectric and (c) the net charge appearing on one of the coated surfaces. The separation between the plates of a parallel-plate capacitor is 0⋅500 cm and its plate area is 100 cm2. A 0⋅400 cm thick metal plate is inserted into the gap with its faces parallel to the plates. Show that the capacitance of the assembly is independent of the position of the metal plate within the gap and find its value. ∴C=∈0 Ad-t=(8.85×10-12)×10-12(5-4)×10-3=88 pFHere, the capacitance is independent of the position of the metal. At any position, the net separation is (d − t). A capacitor stores 50 µC charge when connected across a battery. When the gap between the plates is filled with a dielectric, a charge of 100 µC flows through the battery. Find the dielectric constant of the material inserted. Now, let the dielectric constant of the material inserted be k.
C1C2=q1q2=1k⇒50150=1k⇒k=3Thus, the dielectric constant of the given material is 3. A parallel-plate capacitor of capacitance 5 µF is connected to a battery of emf 6 V. The separation between the plates is 2 mm. (a) Find the charge on the positive plate. (b) Find the electric field between the plates. (c) A dielectric slab of thickness 1 mm and dielectric constant 5 is inserted into the gap to occupy the lower half of it. Find the capacitance of the new combination. (d) How much charge has flown through the battery after the slab is inserted? C=5 μF V=6 Vd=2 mm=2×10-3 m(a) The charge on the positive plate is calculated using q = CV. A parallel-plate capacitor has plate area 100 cm2 and plate separation 1⋅0 cm. A glass plate (dielectric constant 6⋅0) of thickness 6⋅0 mm and an ebonite plate (dielectric constant 4⋅0) are inserted one over the other to fill the space between the plates of the capacitor. Find the new capacitance. The given system of the capacitor will behave as two capacitors connected in series. Let the capacitances be C1 and C2. A parallel-plate capacitor having plate area 400 cm2 and separation between the plates 1⋅0 mm is connected to a power supply of 100 V. A dielectric slab of thickness 0⋅5 mm and dielectric constant 5⋅0 is inserted into the gap. (a) Find the increase in electrostatic energy. (b) If the power supply is now disconnected and the dielectric slab is taken out, find the further increase in energy. (c) Why does the energy increase in inserting the slab as well as in taking it out? ∆E’=12C V’2-12C’V2 ⇒∆E’=123.54×10-10×(166)2-5.9×10-10×(100)2⇒∆E’=1.92×10-6 J=1.92 μJ(c) When the battery is connected, energy is increased after insertion of the dielectric slab because of the increase in the capacitance of the capacitor. Now, capacitor will abstract more change from the battery. When the battery is disconnected, and dielectric slab is taken out then energy stored in the will increase because of increase of potential difference across the capacitor. Find the capacitances of the capacitors shown in figure (31-E24). The plate area is A and the separation between the plates is d. Different dielectric slabs in a particular part of the figure are of the same thickness and the entire gap between the plates is filled with the dielectric slabs. The two parts of the capacitor are in series with capacitances C1 and C2. C=C1×C2C1+C2 =2K1 ∈0 Ad×2K2 ∈0 Ad2K1 ∈0 Ad+2K2 ∈0 Ad =2K1 K2 ∈0 Ad K1+K2(b) Here, the capacitor has three parts. These can be taken in series. C1=K1 ∈0 A/2d=K1 ∈0 A2dC2=K2 ∈0 A2dThese two parts are in parallel. A capacitor is formed by two square metal-plates of edge a, separated by a distance d. Dielectrics of dielectric constant K1 and K2 are filled in the gap as shown in figure (31-E25). Find the capacitance. Let us consider an elemental capacitor of width dx at a distance x from the left end of the capacitor. It has two capacitive elements of dielectric constants K1 and K2 with plate separations (x tan θ) and (d − x tan θ) in series, respectively. The areas of the plates of the capacitors are adx. tan θ=dasubstituting in the expression for capacitance C.
Figure (31-E26) shows two identical parallel plate capacitors connected to a battery through a switch S. Initially, the switch is closed so that the capacitors are completely charged. The switch is now opened and the free space between the plates of the capacitors is filled with a dielectric of dielectric constant 3. Find the ratio of the initial total energy stored in the capacitors to the final total energy stored. When the switch is closed, both capacitors are in parallel. 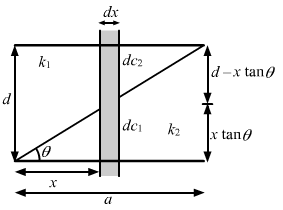 A parallel-plate capacitor of plate area A and plate separation d is charged to a potential difference V and then the battery is disconnected. A slab of dielectric constant K is then inserted between the plates of the capacitor so as to fill the space between the plates. Find the work done on the system in the process of inserting the slab. A capacitor having a capacitance of 100 µF is charged to a potential difference of 50 V. (a) What is the magnitude of the charge on each plate? (b) The charging battery is disconnected and a dielectric of dielectric constant 2⋅5 is inserted. Calculate the new potential difference between the plates. (c) What charge would have produced this potential difference in absence of the dielectric slab. (d) Find the charge induced at a surface of the dielectric slab. ⇒Q=100×10-6×50=5 mC(b) When a dielectric is introduced, the potential difference decreases. A sphercial capacitor is made of two conducting spherical shells of radii a and b. The space between the shells is filled with a dielectric of dielectric constant K up to a radius c as shown in figure (31-E27). Calculate the capacitance. We have two capacitors: one made by the shells a and c and the other made by the shells b and c.
Consider an assembly of three conducting concentric spherical shell of radii a, b and c as shown in figure (31-E28). Find the capacitance of the assembly between the points A and B. The spherical shells form two spherical capacitors: one made by A and B and the other made by B and C.
Suppose the space between the two inner shells of the previous problem is filled with a dielectric of dielectric constant K. Find the capacitance of the system between A and B. A parallel-plate capacitor with the plate area 100 cm2 and the separation between the plates 1⋅0 cm is connected across a battery of emf 24 volts. Find the force of attraction between the plates. Consider the situation shown in figure (31-E29). The width of each plate is b. The capacitor plates are rigidly clamped in the laboratory and connected to a battery of emf ε. All surfaces are frictionless. Calculate the value of M for which the dielectric slab will stay in equilibrium. Let the potential of the battery connected to the capacitor be V.
Let the length of the part of the slab inside the capacitor be x. The capacitor can be considered to be two capacitors in parallel. C1=K1∈0bxd, C2=∈0b(l1-x)dC1 is the part of the capacitor having the dielectric inserted in it and C2 is the capacitance of the part of the capacitor without dielectric. As, C1 and C2 are in parallel. C=K1∈0bxd+∈0b(l1-x)dC=∈0bdl1+x(K1-1)The dielectric slab is attracted by the electric field of the capacitor and applies a force in left direction. Let us consider electric force of magnitude F pulls the slab in left direction. Let there be an infinitesimal displacement dx in left direction by the force F.
Let the potential of the battery connected to the left capacitor be V1 and that of the battery connected with the right capacitor be V2. With the displacement of slab, the capacitance will increase, therefore the energy of the capacitor will also increase. In order to maintain constant voltage, the battery will supply extra charges, therefore the battery will do work. ⇒F=12dCdxV12⇒F=12ddx∈0bdl1+x(K1-1) V12⇒F=∈0bV12(K1-1)2dTo keep the dielectric slab in equilibrium, the electrostatic force on it must be counteracted by the weight of the block attached. Figure (31-E30) shows two parallel plate capacitors with fixed plates and connected to two batteries. The separation between the plates is the same for the two capacitors. The plates are rectangular in shape with width b and lengths l1 and l2. The left half of the dielectric slab has a dielectric constant K1 and the right half K2. Neglecting any friction, find the ration of the emf of the left battery to that of the right battery for which the dielectric slab may remain in equilibrium. Let the potential of the battery connected to the left capacitor be V1 and that of the battery connected to the right capacitor be V2. The left capacitor can be considered to be two capacitors in parallel. C1=K1∈0bxd,C2=∈0b(l1-x)dC1 is the part of the capacitor having the dielectric inserted in it and C2 is the capacitance of the part of the capacitor without dielectric. U=12CV12U=∈0bV122dl1+x(K1-1) …(1)The dielectric slab is attracted by the electric field of the capacitor and applies a force in left direction. Let us consider a small displacement dx of the slab in the inward direction. The capacitance will increase, therefore the energy of the capacitor will also increase. In order to maintain constant voltage, the battery will supply extra charges, therefore the battery will do work. Consider the situation shown in figure (31-E31). The plates of the capacitor have plate area A and are clamped in the laboratory. The dielectric slab is released from rest with a length a inside the capacitor. Neglecting any effect of friction or gravity, show that the slab will execute periodic motion and find its time period. Given that the area of the plates of the capacitors is A. As ”a” length of the dielecric slab is inside the capacitor. C1=∈0A(l-a)ldThe two parts can be considered to be in parallel. C=C1+C2⇒C=∈0AldKa+(l-a) ⇒C=∈0Aldl+a(K-1)Let us consider a small displacement da of the slab in the inward direction. The capacitance will increase, therefore the energy of the capacitor will also increase. In order to maintain constant voltage, the battery will supply extra charges, therefore the battery will do work. 12∈0Aldm(K-1)As, the force is in inward direction, it will tend to make the dielectric to completely fill the space inside the capacitors. As, the dielectric completely fills the space inside the capacitor at this instant its velocity is not zero. The dielectric slab tends to move outside the capacitor. As the slab tends to move out, the direction of the force due to the capacitor will reverse its direction. Thus, the dielectric slab will have a periodic motion.